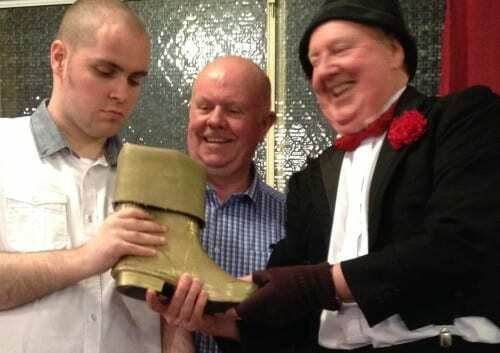 One of Sir Alex Ferguson’s favourite entertainers has won Jimmy Cricket’s latest Golden Wellington award. 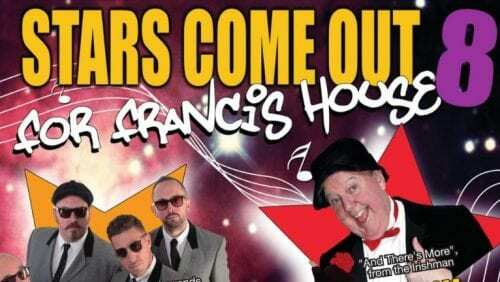 Eric Devereaux has had a stellar career as a compere and male vocalist, his notable stints during the cabaret heyday of the 60s and 70s including being a host at iconic venues such as Cadishead Conservative club in Salford. He was good friends with Hughie Green – the legendary presenter of Opportunity Knocks – and was well-known on the Greater Manchester club circuit, with close ties to comedian Bernard Manning and impressionist Mike Yarwood among others. Eric continues to be one of the favourite performers of Sir Alex, to the point where he has become an annual fixture for the former Manchester United manager’s birthday celebrations each year. He moved to Norden in Rochdale to retire a few years ago, having been based for most of his life in Failsworth. 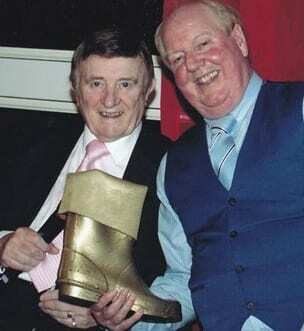 Rochdale-based comedian Jimmy presented the June Golden Welly award to Eric for a lifetime in showbusiness during one of jam night concerts which he arranges every other month at St Vincent’s RC Parish Centre in Norden. Eric is also one of the organisers of an informal northern network of performers who get together periodically to socialise over lunch at the Royal Toby restaurant in Castleton, Rochdale. 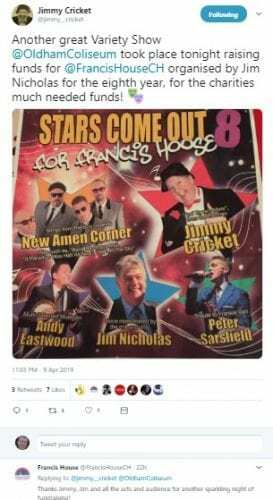 The network, known as the Wooden Hut club, has over the past five years attracted the likes of Jimmy, Buzz Hawkins, Smug Roberts, Bernie Clifton, Arthur Bostrum, Freddy ‘Parrot face’ Davies, Johnny Casson, Andy Prior, Graham Grumbleweed and many more notable entertainers. Jimmy said: “Eric is so deserving of a recognition of his talents and of the wonderful career in showbusiness he’s had over the years. “I just wanted to acknowledge this in my own way. In fact, the award was only a small part of the evening and the main focus was an interview I conducted with Eric that lasted the entire second half of the concert! 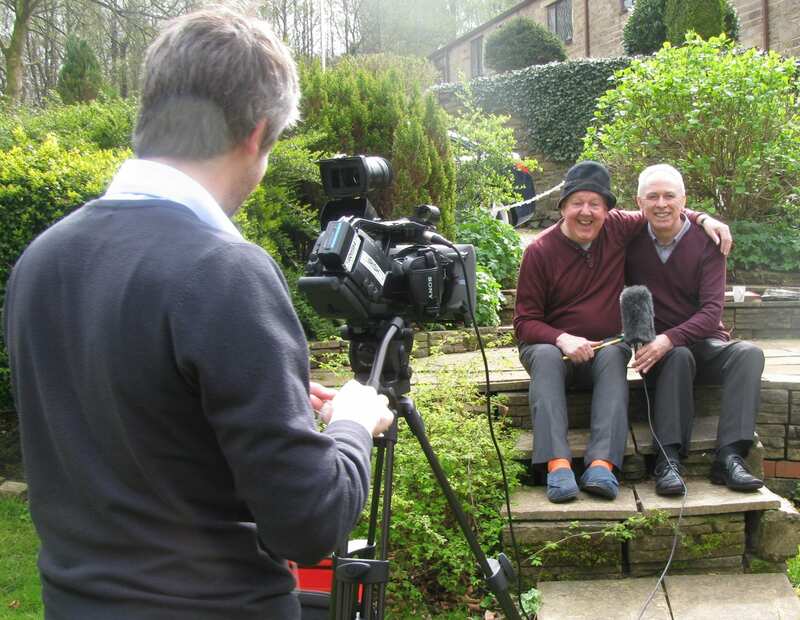 Jimmy Cricket got a special visit from Irish TV to his home in Rochdale recently. The Belfast-born entertainer was among several celebrities from around the Manchester area to be filmed as part of a relaunch by the satellite channel. 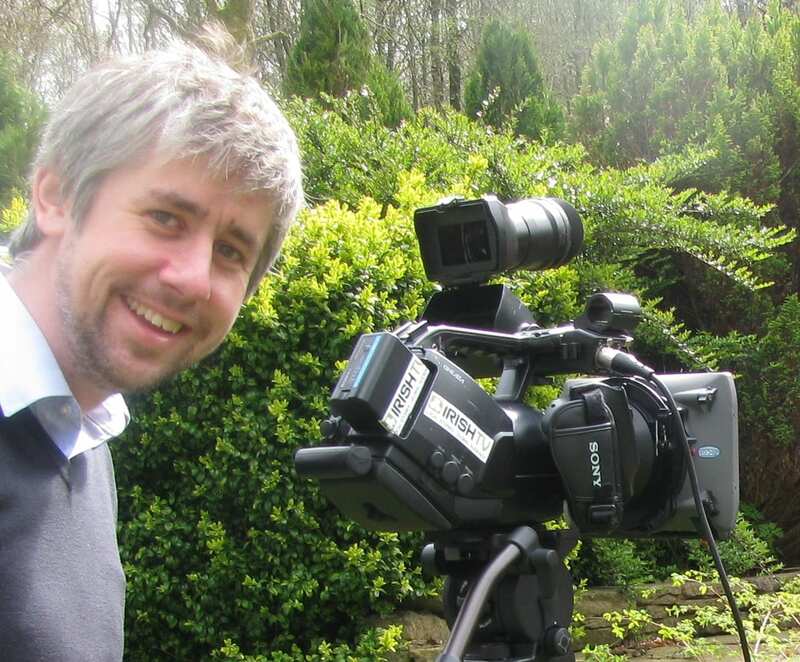 … and meet the cameraman! Irish TV, which is aimed at an audience based in Ireland and the overseas ex-pats market, has a Manchester-based presenter called Martin Logan. Jimmy has previously appeared with Martin on the station. The channel has just had a relaunch in Dublin which will see Martin present a new programme from Manchester each week. To mark the occasion, Martin asked some Manchester-based celebrities with an Irish connection to wish the channel all the very best for the future. So Martin came to Jimmy’s home in late April with his cameraman and they filmed some footage of the funnyman being his usual comical self. A young man described as having “remarkable ability” by famous entertainer Jimmy Cricket is the May winner of the Golden Wellington award. Martin Finn, from Atherton near Wigan in Greater Manchester, is 22 years old and suffers from autism, a lifelong developmental disability that affects how a person communicates with, and relates to, other people. Jimmy said: “Martin’s condition is so significant that it prevents him from speaking in sentences. When Jimmy heard about Martin, he invited him to one of his jam nights at St Vincent’s RC parish centre in Norden, Rochdale. Martin not only wowed everyone present during the evening with his great singing talent, but Jimmy used the opportunity to present him with the Golden Wellington monthly award. Jimmy added: “There has been much recent interest in Martin. As his parents originally hail from the Ireland, he is about to appear on RTE – Ireland’s national TV channel – and in particular on their flagship chat show called The Late Late Show [the longest-running programme of its kind in the world].